Discuss mental illness regularly, incorporate more exercise and encourage honest dialogue, suggests the government’s mental health champion for schools. We all know the basic requirements to maintain good physical health. We know we must eat well, exercise regularly, drink plenty of water, alcohol in moderation etc. These golden rules have been impressed upon most of us since we were old enough to comprehend them. When it comes to mental health, however, we’ve been taking a different tack; most of us wait for mental illness symptoms to arise before giving the health of our minds any consideration. It’s a strategy that’s been disastrous for an entire generation of British people (and in particular those under the age of 25). A person’s mental health cannot be seen and there is still a significant stigma attached to discussing mental health problems something which, in my capacity as the government’s mental health champion for schools, I am working hard to change. Statistics tell us that one in four people in the UK will experience a mental illness each year. Yet we all have a brain and, therefore, a mental health. What if we gave consideration to how we might make lifestyle choices, and create an environment and society which is conducive to good mental health? It was from this starting point that our Self-Esteem Team lessons for teenagers were born. We wanted to give young people the mental equivalent of their five-a-day; simple tips which improve self-esteem, promote positive body image, reduce stress and nurture the wellbeing of their minds. The problem with PSHE is that, while it is a valuable addition to a spectrum of solutions for promoting wellbeing within schools (and should, in my opinion, be statutory), it has the potential to be stigmatising. Take lesbian, gay, transgender, bisexual and queer (LGBTQ) rights, for example. If someone in a year group has come out, it isn’t necessarily helpful to then have an assembly on homophobic bullying, in which everyone is acutely aware they have been gathered together to discuss an issue relating to that person, and then to never touch upon the subject again. Stonewall, the LGBTQ rights organisation, instead recommend all teachers casually embed all sexualities into their lessons. We can take a similar approach to mental health. In biology we can discuss mental health when we learn about how the brain functions, in English we can touch upon an author’s mental state, in citizenship we can discuss the treatment of people with mental illness within the legal system. By consistently and casually mentioning a topic we take away some of the scariness. It also decreases stigma. In one school I visit in Nottinghamshire, an ex-pupil drops by about once a week at lunchtime just to hang out with the current students. She has bipolar disorder and wants to show them how “normal” she is, to give mental illness a face. You cannot put a price on simple techniques like this. Under the last administration, then secretary for education Michael Gove refused to make it mandatory for state school children to do a minimum of two hours of PE every week. As a result, the average state school child alternates between doing two hours one week and then just one hour the next. When changing time is taken into account, this means that some weeks they’re realistically only getting about 40 minutes. Children and young people need to move regularly in order to think clearly. They simply aren’t designed to be trapped in a small room having information thrown at them all day. In addition, a sedentary lifestyle is terrible for our mental health, since the body and the brain work in tandem. You can incorporate exercise into the school day, without too much disruption. 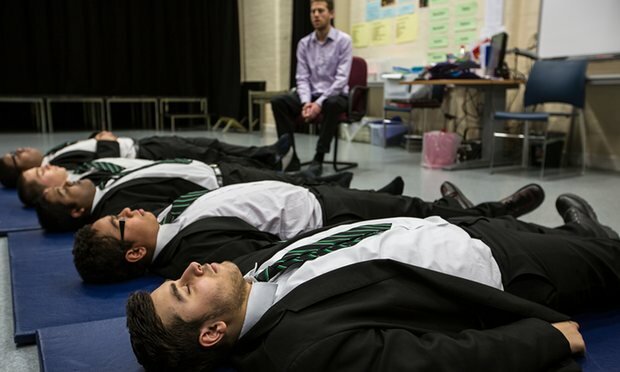 For example, some schools have trained a member of staff in primal stretch, a 10-minute yoga-type activity that takes place at break time or at the end of lunch. These schools have reported an increase in energy levels, attention spans and grades. Just last month we saw schools report the benefits of simply getting their children to run outside for a short period of time every morning. Technological advances mean there is the biggest gap in cultural understanding between adults (parents and teachers) and children since the 1960s. We must try to bridge the “us and them” divide because communication is key to good mental health. For parents and teachers to have an open and honest dialogue with their children, they must understand their world and what is important to them. Help young people find their passion and give them a healthy way to express themselves. Everyone needs a creative outlet, something which lets them exorcise difficult feelings, perhaps through sport, art, music or drama. If we have this, we’re far less likely to express ourselves in more harmful ways. Ask pupils to find their favourite online article, YouTube video or hashtag for the class to discuss in form time. Encourage them to hunt for something positive by steering them towards news, art, music, photography and human interest. Ask everyone to listen without judgment, but also encourage critical thinking if needed. A study by Professor Rachel Thompson in 2013 found young people see social media as more “real” than their three dimensional existences at home and at school. By immersing yourself in their world, as a teacher, you give yourself the tools you need to help them combat the worst aspects of the web and embrace the best. These tips might not seem particularly ground breaking or revolutionary, but the evidence shows that our daily habits have the most effect on our wellbeing. Incorporating simple changes into the school day not only impacts pupils, it can also have a profound positive impact on teachers, too. How do children decide what’s fair?